Thanks for stopping by to see my Fun with Washi Tape post. The idea for today’s card was some inspiration I found on Pinterest. 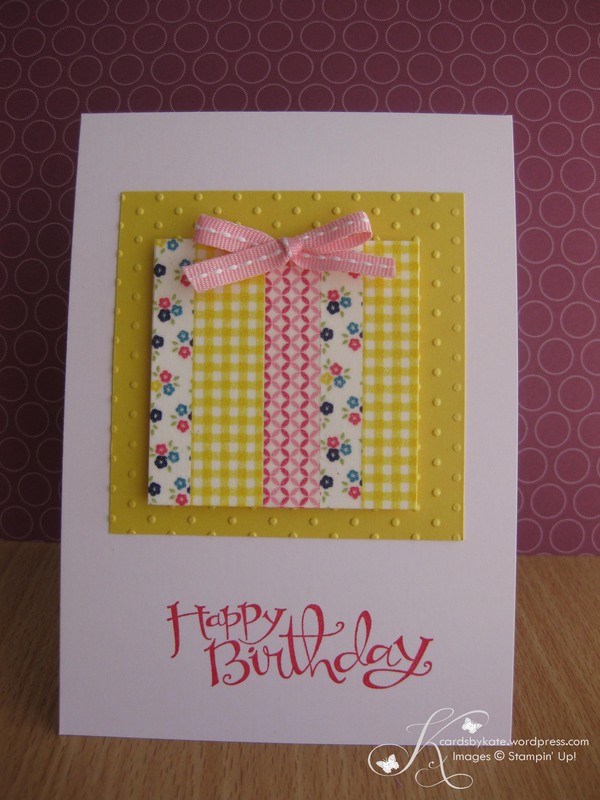 This card has lots of white space topped with a sweet little Washi tape present complete with bow. I added a small yellow background for a splash of happiness! This is one of the quickest cards ever to put together and great for mass producing. Thought I might even do this for a group of non-crafters at my next Party so they can see just how easy it is to make a quick card without being overwhelmed. Then I came across the idea of making some cute Washi Tape toothpick flags, while baking cupcakes for my daughter’s 4th birthday. Stay tuned to see them another day! What I love so much about working with Washi Tape is that the projects are so quick, easy and the tape is so workable…. and it’s fun!